Come to Rishikesh and celebrate Holi in the yoga capital of the world. Enjoy the color festival with yoga, meditation, and detox holidays. Visit Beatles ashram, Ganga Arti, temples and famous ashram of Rishikesh, and enjoy the river rafting, trek to waterfall, and color festival in Rishikesh. Don't miss out on this wonderful experience of adventure and relaxation while enjoying the beautiful surroundings of Rishikesh. 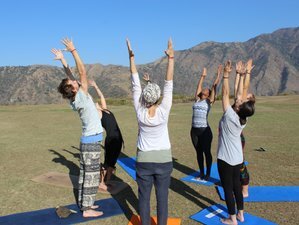 The school is located near the bank of holy river Ganga, the retreat center is built and maintained like ashram so the guests can feel the atmosphere of yogis and make their yoga tour a life-changing experience on the foothills of Himalayas. Rishikesh Yog Sansthan-AYS provides single or shared rooms for students as per their choice. The accommodation of RYS Yoga School are well equipped with all facility which is necessary for students. The visitors or participants will have a pleasant stay. The school of Rishikesh Yoga Retreats is furnished with all modern facilities, luxury, and comforts. The rooms also offer long baths with running hot and cold water. If there is anything else you require, just let the staff know as they are always at your service for 24 hours. The beautiful surroundings of the hotel are backed by facilities which every traveler will want. 24/7 Wi-Fi around the campus, personal washrooms attached to the bathroom with western commode, spacious and well-ventilated yoga hall, coffee table and a cupboard in the room, pick up and dropoff facilities as per booking, and purified drinking water available at all times. Ashrams usually represent a return to a simpler way of living, which is very different to a hotel. Generally there is a more communal atmosphere and often an expectation that guests will pitch in with whatever needs doing. Rishikesh has a spectacular view of jungle-clad hills. It also has a confluence of River Ganges, which is the glorious attraction of Rishikesh, running rapidly throughout the city. Apart from spirituality, now Rishikesh is also a hub for adventurous activities such as rafting, camping, trekking, and bungee jumping making Rishikesh full of tourists every time. There are also big ashrams, centers for yoga, meditation, Ayurvedic massage, and astrology. Rishikesh is also known as the white water rafting capital of India. Please book your flight to arrive at Dehradun Airport (DED) or Indira Gandhi International Airport (DEL). Transfer from and to this airport is available upon request with an additional fee of 20 USD for Dehradun Airport (DED) and 70 USD for Gandhi International Airport (DEL). Being a popular tourist destination, Rishikesh has a good network of buses connecting it with important places such as Haridwar, Dehradun, and New Delhi. Airport: Jolly Grant Airport Airport transfer available: Jolly Grant Airport (US$20 per person) Additional charges may apply. You can request this in the next step. Airport: Indira Gandhi International Airport Airport transfer available: Indira Gandhi International Airport (US$70 per person) Additional charges may apply. You can request this in the next step.